The Suez crisis in October 1956 prompted France to look into setting up a “strategic intervention force”, equipped with nuclear weapons. Soon after General Charles de Gaulle came into office, in June 1958, he said France was to single-handedly develop what he called its “dissuasion of aggression” weapon. The scheme involved an aircraft first, and a ballistic missile later. In fact, besides the scale effect, the air-friction heating is very different. The Mirage IV was chosen. Whereas the Mirage III could only withstand Mach 2 for a few minutes, the Mirage IV needed to hold that speed for much longer than the 20 or so minutes required for the temperature to stabilize throughout the outer structure and inner casings housing the equipment, petrol and hydraulic liquid. Every component, therefore, needed to undergo a full thermal assessment. French equipment manufacturers fulfilled virtually all the requirements. The bomber’s specifications were jointly defined by government authorities and Dassault staff, and cleared on March 20, 1957. The Mirage IV 01 was an experimental prototype designed to discover the problems inherent in sustained supersonic flight. The general appearance of Mirage IV 01 was very like that of the Mirage III A with respect to its surface area, engine configuration and empty weight. It nevertheless carried three times more internal fuel. Manufacture, at the Saint-Cloud factory, lasted 18 months. It left the factory at the end of 1958 for final adjustments at the Melun-Villaroche base before proceeding to flight tests. Although its aerodynamic specifications were very similar to those of the Mirage III, its structure, layout and equipments demanded specific developments. Temperature differences during rapid acceleration or deceleration imposed constraints which had to be taken into account when determining the dimensions. The Snecma Atar 9 B jet engines – 13,200 lb of thrust with reheat – were identical to those of the Mirage III A which first flew in May of 1958, a full year before the Mirage IV. The Mirage IV was the first French aircraft to incorporate one-way electronic flight controls for pitch and roll. The bomb carrier was to be a bomber aircraft. A second aircraft for electronic reconnaissance and offensive jamming was to prepare the way for the bombers and accompany the bombing raid. On May 5, 1959, three pre-production Mirage IV Bs were ordered, of which the first was scheduled to fly before July 1, 1961. Mirage IV 01 was now considered as a small scale prototype for the development of the navigation and bombardment system. In September 1959, the desire to avoid constructing a foreign aeroengine under license for the propulsion of the Strategic Nuclear Force led to the adoption of a smaller, less expensive aircraft, the Mirage IV A. This was the end of the Mirage IV B program. On June 17, 1959, Roland Glavany took off for the first time at 10:20 am. The flight lasted 40 minutes. For its third flight, on June 20, 1959, Mirage IV 01 was authorized to make a flight pass over the Paris Air Show with General de Gaulle among the onlookers. 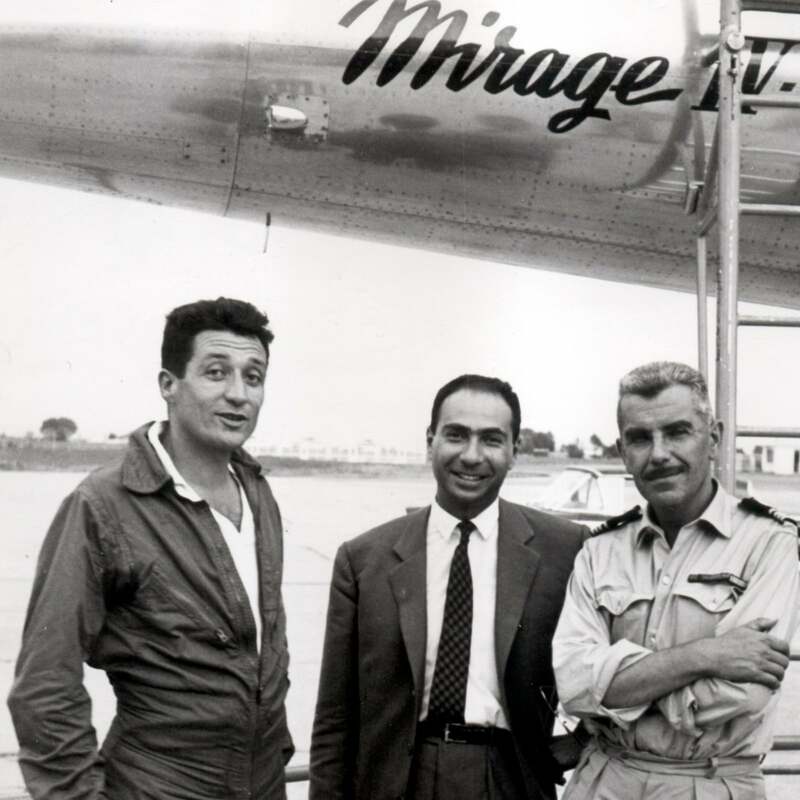 On September 19, 1960, at 05:05 pm, René Bigand took off from Melun-Villaroche in Mirage IV 01 and broke the world speed record over a 1 000-km closed circuit (1 822 km/h). Flight 138, on September 23, corroborated the initial performance and pushed the record on a 500-km closed circuit to an average of 1 972 km/h, flying between Mach 2.08 and Mach 2.14. 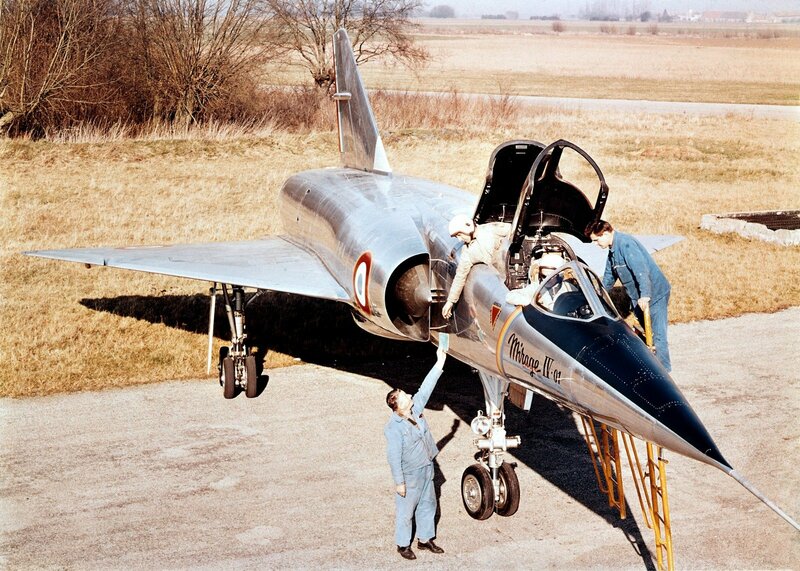 A new definition of the aircraft, with Snecma Atar 9 D engines was approved in October 1959 under the name Mirage IV A. The requirements were for a take-off weight of 32 tons and a minimum range of 1 100km/594 nm (of which one half at supersonic speed), which could be augmented by in-flight refueling. It became clear very early on, to the State and to Dassault, that the working methods and contract structures used on previous programs made it unfeasible to complete this program by the established deadline. It was, in fact, France’s first attempt at creating a globally integrated weapon system. The precision requirements involved making all the weapon system components operate interdependently. Serial production required using every one of France’s 300 or so aeronautical firms. Dassault’s work proper accounted for 17 % of this aircraft’s total flyaway cost. The contract for 50 aircraft was confirmed on May 29, 1962 and another on November 4, for a further 12 aircraft of the same definition, but capable of carrying a reconnaissance pod. 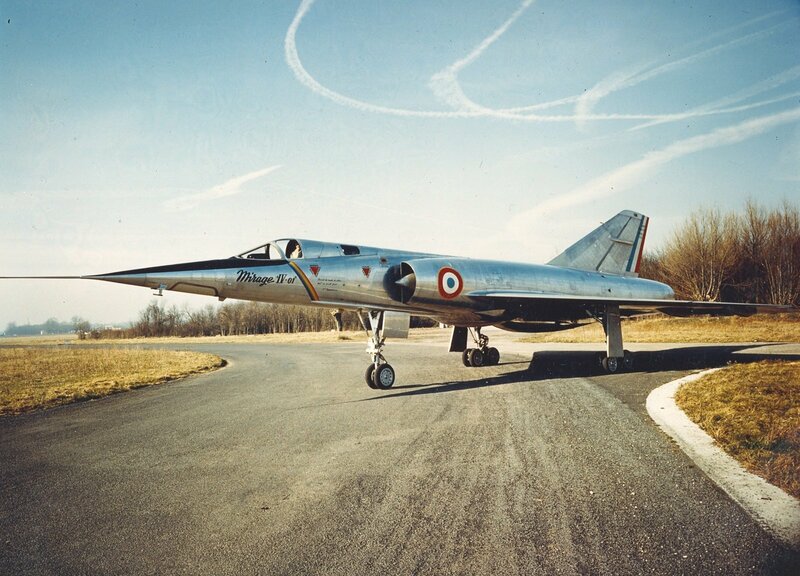 Production aircraft n°1 made its maiden flight at Mérignac on December 7, 1963, with René Bigand at the controls. It was delivered to the Air Force in February 1964, By October of the same year, the first bomber squadron, at the Mont-de-Marsan airbase, was declared operational. The strict deadline had been met ; France had become a genuine nuclear power. 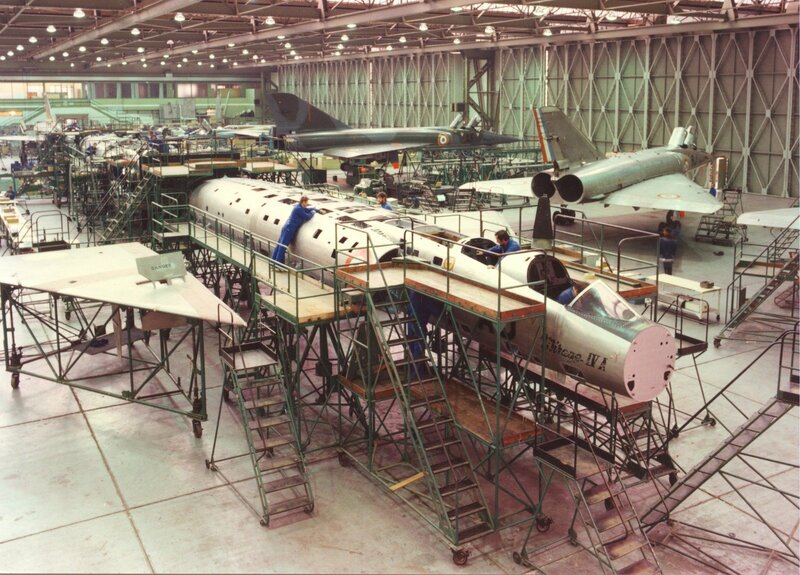 The Strategic Air Forces were equipped at the rate of two aircraft a month up until March of 1968. When it entered into service back in 1964, the Mirage IV A was the first European military aircraft capable of sustained flight at Mach 2; it is still the only one in Western Europe. The last Mirage IV (P) were retired from operational service in 2005. 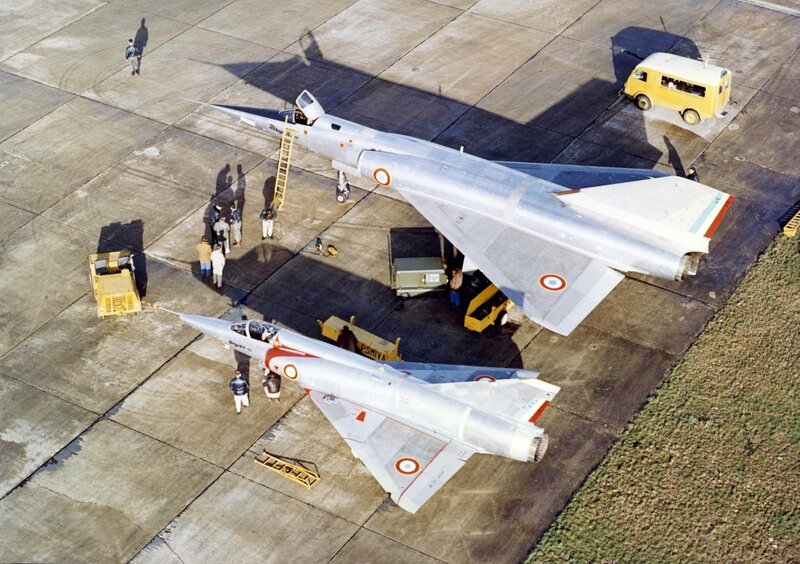 Every aspect of the Mirage IV program unfurled commendably. Designers overcame every technical challenge. Its speed, altitude and flight radius matched the technical specifications. Pilots who have flown it have described its handling as extraordinary. The navigation and bombing system met all the required stipulations. And it was finished within the tight schedule disclosed in 1958.